I‘ve just returned from the San Diego-Tijuana border where I had the honor of participating in “Love Knows No Borders” — an interfaith action sponsored by the American Friends Service Committee (AFSC) and co-sponsored by a myriad of faith organizations from across the country. As a staffer for AFSC and a member of Jewish Voice for Peace (one of the many co-sponsoring organizations), I took a special pride in this interfaith mobilization, in which more than 400 people from across the country gathered to take a moral stand against our nation’s sacrilegious immigration system. I’m particularly gratified that the extensive media from our action could shine a light on the brutal reality at our increasingly militarized southern border. This entry was posted in American Friends Service Committee, Gaza, Hanukkah, Human Rights, Immigration, Interfaith, Israel, Jewish Voice for Peace, Nonviolence, Palestine, Racism, Religion on December 15, 2018 by Rabbi Brant Rosen. This entry was posted in Hanukkah, Israel, Jerusalem, Judaism, Poetry, Religion on December 15, 2017 by Rabbi Brant Rosen. 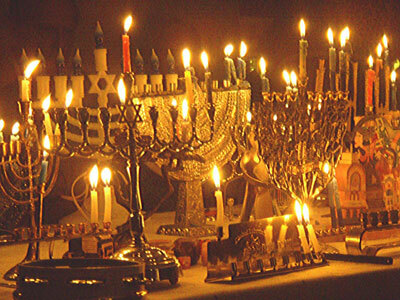 The festival of Hanukkah commemorates the victory of the Maccabees, a Jewish priestly family from the Hasmonean dynasty, over the Seleucid Empire in 2nd century BCE. According to the Talmud, when the Maccabees entered the desecrated Temple in Jerusalem and attempted to relight the menorah, there was only enough oil for one day. But when they lit the fire, a miracle occurred and it lasted for eight full days. What’s the meaning of this simple parable? Some say that the image of increasing light is appropriate to the dark winter season — a time in which many religious traditions celebrate festivals by kindling lights. Others say that this story underscores a powerful political/spiritual truth: Even in the bleakest of times, an oppressed people will somehow find the strength to continue the struggle. When I light my Hanukkah candles this year, I plan to light an extra one each night for Gaza. Two months ago, I had the opportunity to travel to Gaza as a staff person for the American Friends Service Committee (AFSC). My visit left me with a myriad of impressions and emotions, foremost of which was a sense of awe at the ability of Palestinian Gazans to live with resilience and dignity under the most oppressive of conditions. 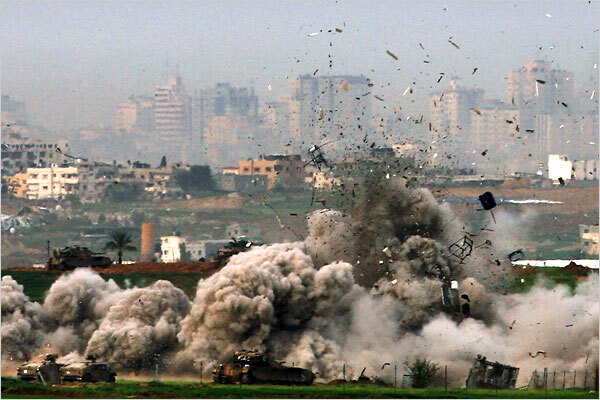 I do not want to minimise the severity of daily life in Gaza. I am someone who has insisted the siege be recognised as genocidal. Nevertheless, I am appalled at the callousness of the interviewer as she asks for an elaboration of how people in Gaza have lost their “internal morality,” their very “humanity”. I saw a great deal of humanity during my short stay in Gaza. I traveled there to participate in strategic planning meetings with AFSC staff colleagues, to sharpen our vision for our Israel/Palestine programs in the US, Israel, the West Bank and Gaza. We began with three days of meetings in Ramallah, with our Gaza staff members joining us via Skype. Following these meetings, six of us traveled to Gaza to meet with our two full-time staff members there: Ali Abdel Bari and Firas Ramlawi. Up until relatively recently, AFSC’s Palestine youth program focused largely on public achievement, seeking to strengthen the civic ties of youth to their communities. Our current program, Palestine Youth Together for Change (PYTC) is a more ambitious project, working to combat Palestinian geographical, social and cultural fragmentation in Israel, the West Bank and Gaza. It’s difficult to overestimate the devastating impact of this fragmentation — particularly on Palestinian youth who are growing up with increasing separation from one another. This isolation is most keenly felt, of course, by the youth of Gaza, who are literally imprisoned by Israel inside a small 140-square-mile strip of land. When we met the Gazan youth who participated in the PYTC program, they spoke powerfully about their experiences growing up with a strong sense of Palestinian identity while isolated from their peers in Israel and the West Bank. This particularly hit home for me when I heard one young woman speak of entering into Israel through the Erez Crossing for the first time to travel to the West Bank for meetings with her fellow participants. She was 18 years old and had never seen an Israeli Jew in person in her life. Up until that time, she said, she had only seen them as “helicopters, planes and bombs.” Needless to say, this contrasted dramatically with the experiences of her West Bank peers, who encountered Israeli soldiers as a very real, everyday presence in the streets and at checkpoints. It’s also important to bear in mind that this isolation is not a “humanitarian” issue that can be fully addressed by greater NGO and civil society investment. Rather, it is the result of very real and very intentional policies promulgated by Israel to purposefully divide and weaken Palestinian society. By the same token, the PYTC program is not merely a youth service project; its ultimate goal is to strengthen Palestinian identity in order to counter the brutal and unjust occupation of their people. In this regard, this program is connected in important ways to AFSC programs in the US that promote “co-resistance”: initiatives that support the Palestinian civil society call for Boycott, Divestment and Sanctions; advocate for Palestinian children held by Israel in military detention; and educate the public about the devastating costs of the Gaza blockade. The latter program, “Gaza Unlocked,” seeks to educate the public about the reality of the blockade by sharing the stories — and the humanity — of the people who live there. This is life. We should not give up. I will maintain my humanity and my dreams despite the siege. I believe in change, if not immediate then with time. I will be an example for my brothers and my sisters and whoever dreams of a future, for they are my hope for the future. We reject the images of us that are being shown to the world. We are humans. We are proud of our humanity. We are proud of our achievements despite the difficult circumstances. No one can achieve what we have done. Despite the blockade, the wars, the structured destructions, we continue to live and fight for a dignified life. We fight against the imposed restrictions, being triggered by our desire for life. I must challenge this situation. I don’t have any choice. This affects our daily lives and our emotional well-being. We are under all this pressure. What inspires me is the faith that this situation is not eternal. I can change it or its consequences. I can at least limit its impact on me and those I love. According to history, no oppression lasts forever. This nation deserves better. During our final night in Gaza, my colleagues and I walked through the streets of Gaza City on our way back from dinner. Because Gaza only receives four hours of electricity a day, the street lights and home windows around us were dark. The only light came from beachfront hotels that had their own generators. We were well aware that we were staying in the affluent tourist part of town and that we were privileged enough to soon be leaving Gaza to travel without restriction. But to paraphrase Shareef Hamad, I am inspired by the faith that no darkness is eternal. During Hanukkah, we celebrate the miracle of light that sustains us even when the world is at its darkest. This Hanukkah, I’ll be lighting a candle for Gaza. This entry was posted in American Friends Service Committee, Gaza, Hanukkah, Human Rights, Israel, Judaism, Palestine, Refugees, Religion on December 12, 2017 by Rabbi Brant Rosen. It is a tragic irony that the festival of Hanukkah, a Jewish holiday that commemorates an ancient uprising against an oppressive Assyrian ruler, is being observed as we hear the unbearably tragic reports coming from an uprising in modern-day Syria. Though the historical contexts of these two events are centuries apart from one another, I can’t help but ask what lessons the Hanukkah story might bring to bear on the sorrows of contemporary Syria. Aleppo has just fallen to Syrian government forces after a brutal years-long battle with rebel groups. The carnage in Aleppo is only the latest tragedy in a war that has taken hundreds of thousands of lives and has created millions of refugees and internally displaced Syrians. The beginning of the war can be traced back to the Arab Spring of 2011, when pro-democracy protests erupted in southern Syria. Government security forces opened fire, killing several protesters. Soon there were nationwide protests demanding the President Assad’s resignation. By July 2011, hundreds of thousands were taking to the streets across the country. As the violence escalated, the country descended into civil war. Rebel groups were formed to battle Syrian government forces for control of cities, towns and the countryside. While many committed to the fall of the Assad regime continue to view this war as a revolution against an oppressive ruler, others characterize it as a sectarian civil war between forces that serve as proxies of larger world powers — i.e., Russia and Iran on the side of the Assad regime and the US, Turkey, Saudi Arabia and Qatar in support of certain rebel forces. The crisis is further complicated by the presence of jihadi elements in various rebel groups. So now to return to my original point: What on earth could this contemporary geopolitical crisis have to do with events that took place in the Assyrian Seleucid empire circa 168 BCE? The rabbis of the Talmud were not, to put it mildly, huge fans of Judah Maccabee and his followers and they were loath to glorify the Books of the Maccabees — secular stories of a violent war that were never actually canonized as part of the Hebrew Bible. In fact, the festival of Hanukkah is scarcely mentioned in the Talmud beyond a brief debate about how to light a menorah and a legend about a miraculous vial of oil that burned for eight days. Notably, the words of the prophet Zechariah, “Not by might and not by power, but by my spirit, says the Lord of Hosts” was chosen to be recited as the prophetic portion for the festival. Hanukkah remained a relatively minor Jewish festival until it was resurrected by early Zionists and the founders of the state of Israel, who fancied themselves as modern-day Maccabees engaged in a military struggle for political independence. At the end of his book “The Jewish State,” Zionist founder Theodor Herzl famously wrote, “The Maccabees will rise again!” Even today, the celebration of the Maccabees as Jewish military heroes is deeply ingrained in Israeli culture. In more recent years, however, there has been a reconsideration of the Hanukkah story by many contemporary rabbis, Jewish educators and academics. Typically referred to as “the real story of Hanukkah” some advocates of this new pedagogy assert that the Maccabees were actually a kind of “Jewish Taliban” — and that if they were around today they would not look too kindly on the practice of liberal American Jews. The evolution of the Maccabean legacy brings to mind the age-old adage, “one person’s terrorist is another person’s freedom fighter.” While some Jewish observers do not hesitate in referring to them as “religious fanatics,” others insist they were simply “legitimate freedom fighters doing what many freedom fighters do.” In the end, there are no easy answers to this debate. At the very least, we might say that the story of Hanukkah invites us to struggle deeply and honestly with the messy nature of uprising and revolution. Indeed, perhaps these are the central questions we are asked to confront on Hanukkah. To Zionists who glorify the Maccabees as courageous freedom fighters for national liberation we might well ask: Should not we then view the Palestinians as Maccabees as well? And to those who dismiss the Maccabees as religious extremists, we might pose the challenge: Would we deny them their resistance against an imperialist Seleucid empire that outlawed the practice of Judaism on pain of death? I would submit that these kinds of questions are just as germane to the tragic, years-long crisis in present day Syria. On the one hand, there can be no doubt that the Assad regime, along with its Russian and Iranian allies, has committed well-documented atrocities against its civilians as it strikes back against rebel groups. However, these factions have carried out their share of indiscriminate attacks on civilians as well. There has also been fierce sectarian fighting between rebel groups themselves — most notably between Daesh and Al-Qaeda/Al-Nusra/Jabhat Fateh al-Sham. The US, along with its Gulf state allies, continue to insist that regime change is the only acceptable outcome to these hostilities. However, as has historically been the case with US-sponsored “regime changes” in the Middle East, we know that these interventions invariably lead to more, rather than less instability. Others insist we cannot ignore the fact that this rebellion still constitutes an uprising against a brutal totalitarian dictator. Yet this resistance has become profoundly splintered — and as the US and its allies attempt to support it, they are now utterly unable to distinguish between moderate and jihadist rebel groups. As citizens of the US, our primary responsibility is to hold our government accountable for its decisions and actions. And we must also hold it accountable for its covert and overt military meddling in Syria at least as far back as 1949 (when the CIA engineered a coup replacing the democratically elected president Shukri-al-Quwatli and replaced him with a dictator — a “convicted swindler” named Husni al-Za’im). The US decision to support Turkey, Qatar and Saudi Arabia in their ill-conceived plan to overthrow the Assad regime was primarily a function of the primordial interest of the US permanent war state in its regional alliances. The three Sunni allies control US access to the key US military bases in the region, and the Pentagon, the CIA, the State Department and the Obama White House were all concerned, above all, with protecting the existing arrangements for the US military posture in the region. Indeed, our government’s insistence on regime change has motivated the CIA to work with odious allies to help the transfer of weapons to rebel groups about whom they had little, if any knowledge. It also led later to the Pentagon’s decision to provide formal training and arms transfers to these groups. Our meddling with Syria rebel groups has become so confused that we have actually created a situation in which CIA armed militias and Pentagon armed groups are now fighting against one another. Examining the al-Nusra-Israeli alliance in the region, it’s clear that the bonds between the two parties have been exceedingly close. Israel maintains a border camp for the families of Syrian fighters. Reporters have documented Israeli Defense Forces commandos entering Syrian territory to rendezvous with Syrian rebels. Others have photographed meetings between Israeli military personnel and al-Nusra commanders at the Quneitra Crossing, the ceasefire line that separates the Syrian-controlled territory and the Israeli-occupied territory in the Golan Heights. In other words, as Americans and as Jews, our community faces a genuine reckoning over our complicity in the tragedy that is befalling Syria. I grew up in Buenos Aires amidst a community of Syrian Jews. My grandparents had left Aleppo decades earlier, but Aleppo never left them. Our lives were infused with Aleppo’s sumptuous tastes and smells, with its music, its language, its social norms, and the memory of its streets and glorious synagogues. Aleppo was to us simultaneously remote and intimately close, exotic and familiar. One particularly celebrated aspect of Allepan Jewish history dates back to the 15th century, when the Jews of Spain were expelled following the Alhambra Decree of 1492. This exodus of Sephardic Jews initiated a migration and settlement throughout the Ottoman empire, including Syria. A significant number of exiled Jews were welcomed into Aleppo, and in gratitude they began a ritual of lighting an extra candle on Hanukkah — a ritual that Jews of Allepan/Syrian heritage observe even to this day. This Hanukkah, I’ll be lighting an extra candle as well — in protest against those who have been exploiting the violence in Syria for their own cynical gain, in gratitude to those who have opened their homes and communities to receive the uprooted, and in memory of the present-day Syrians who have been killed in this cruel and needless war. This entry was posted in Current Events, Hanukkah, Human Rights, Iran, Islam, Israel, Judaism, Politics, Refugees, Religion, Russia, Syria, Terrorism, War, World, Zionism on December 23, 2016 by Rabbi Brant Rosen. Last December, on the third anniversary of Israel’s Operation Cast Lead, Rabbi Alissa Wise and I submitted an article to the Washington Post in which we asked the public to mark this occasion by lighting a Hanukkah candle for Gaza. The piece was edited further and we were told that it would run in WaPo’s online “On Faith” section. At the eleventh hour, one day before our piece was to run, we were asked to make some more substantive edits in ways that would have significantly altered the message of the article. Unlike the earlier changes, these weren’t editorial tweaks – they were all too familiar pro-Cast Lead talking points. Alissa and I rejected the last minute demands, and offered even more links to substantiate our claims. In the meantime, Hanukkah came and went and ultimately the piece never ran. Fast forward to last week: blogger Phil Weiss had learned about the whole sad story and wrote a short post about it on Mondoweiss. After reading it, I got in touch with him and gave him the full background. M’weiss posted the complete story today, complete with the text of WaPo’s censored version. So click below to read the article that never saw the light of day. Not seasonally appropriate any more, but still sadly relevant. This entry was posted in Gaza, Hanukkah, Human Rights, Israel, Palestine, War on March 2, 2011 by Rabbi Brant Rosen. It’s only mid-day and already more than several people have e-mailed me David Brooks’ NY Times editorial on the meaning of Hanukkah. As those who know and love me will attest, I am not a huge fan of the actual Maccabee story – so I was interested to read Brook’s fairly accurate historical retelling. (The Maccabees) were not the last bunch of angry, bearded religious guys to win an insurgency campaign against a great power in the Middle East, but they may have been among the first. They retook Jerusalem in 164 B.C. and rededicated the temple. Their regime quickly became corrupt, brutal and reactionary. The concept of reform had been discredited by the Hellenizing extremists. Practice stagnated. Scholarship withered. The Maccabees became religious oppressors themselves, fatefully inviting the Romans into Jerusalem. (There) is no erasing the complex ironies of the events, the way progress, heroism and brutality weave through all sides. The Maccabees heroically preserved the Jewish faith. But there is no honest way to tell their story as a self-congratulatory morality tale. The lesson of Hanukkah is that even the struggles that saved a people are dappled with tragic irony, complexity and unattractive choices. Truth be told, with every passing year, I find myself relying less and less upon Maccabean history – however watered-down – to provide me with a spiritual foundation for the observance of Hanukkah. I’m much more interested in the universal meaning of the festival: increasing the light during an increasingly dark time of year. Isn’t this all the lesson we need? As the dark descends, Hanukkah comes to remind us that brighter times are in our future. Keep it in mind as you light the first candle tonight. This entry was posted in Hanukkah, Judaism, Religion, Spirituality, War on December 11, 2009 by Rabbi Brant Rosen.